Bring a wealth of hummingbirds right to you and enjoy watching them dine up close with this Songbird Essentials HummerRing Hummingbird Feeder Assortment. 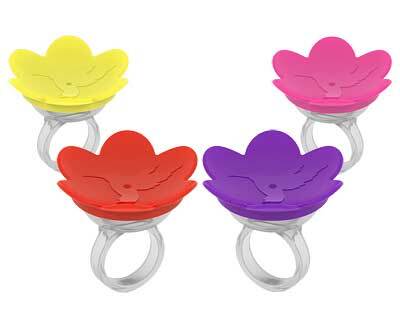 This package includes 4 of these adorable, plastic rings, for a bright look in your bird garden or on a table. Each unit can rest in a small pot or within a plant, and the red, pink, yellow, and purple tops fantastically capture attention. A port in the center of each colored cap allows a single bird to dine, and the base reservoirs each hold 0.3 ounces of nectar. Once hummingbirds are acclimated to these feeders, place one on your hand and wear it as a ring. Remaining still and extending your arm outward invites these flying jewels to land and dine, so you can watch their feeding habits up close. The all plastic construction of each unit makes them perfect for offering to children, helping them appreciate the natural world in an exciting new way. Lift the vivid cap off of the base of each ring to refill the reservoir or thoroughly clean the units. Invite several hummingbirds to dine from your hand with this HummerRing Hummingbird Feeder Assortment. Made in the USA. Aspects HummBlossom Hummingbird Feeder, Plum, 4 oz.